Heart & Soul Hospice careers provide opportunities for nurses, home health aides, social workers, chaplains, therapists, volunteers and physicians on our interdisciplinary teams. The hospice RN case manager makes sure that everything is in place to carry out the care plan. This includes proper staff, equipment, supplies and medications. The hospice Nurse is highly trained in making patient assessments and providing all necessary care to ensure proper pain and symptom management and that the patient’s needs are met. The hospice home health aide or CNA is there to provide for the basic needs of the patient. Bathing, changing, feeding, checking of vital signs and reporting any significant changes in the patient’s condition. The hospice social worker evaluates the needs of the patient and their family upon admission. They specialize in helping the patient and family come to terms with terminal illness and to advocate for the patient’s needs and rights. They may also act as a grief and/or bereavement counselor to the patient and their family. The hospice therapist includes a number of different disciplines i.e. ; physical therapist speech-language therapist, massage therapist, music therapist… these services are provided for those hospice patients that would benefit from the therapy. The hospice volunteer provides various services to the patient, the family and the hospice. Whether reading, letter writing or just being a friendly visitor to the patient; or sitting with the patient so the family can have a break; or serving the hospice by helping with duties in the office, the volunteer is a very important part of the team and is required by Medicare. 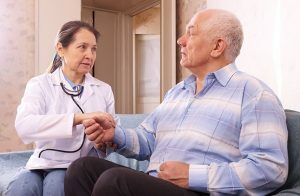 The hospice physician or Medical Director works in conjunction with the patient’s regular physician so that the patient receives the best care ensuring comfort and quality of life.